I’m so happy to introduce the Norton cowl pattern! 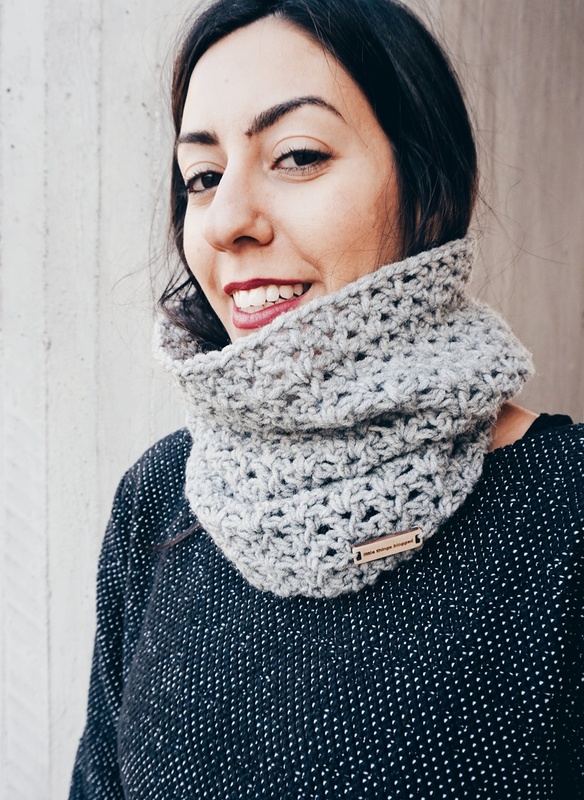 This cowl, might be the best beginner crochet cowl pattern you’ve ever seen! The cowl, is basically crocheted in the round, using the textured V-stitch that is decievingly simple – just work double crochet stiches with a couple of chains in between! It’s the perfect project to make while you binge watch your favorite Netflix special – no counting or fancy stitches required! This pattern is easily customizable to make it shorter, longer, wider or thinner. Feel free to adjust as you see fit – but know that the dimensions given were hand picked for a cozy and snuggly fit! For the yarn, I used Alize Lanagold which is a worsted weight yarn! One nice equivalent to use would be Lion Brand Heartland yarn for a couple of reasons – it’s a drapey worsted weight yarn in the right earth-inspired colors (Mount Rainier is my favorite). If you use the specified hook size and yarn or your project will be the same size as that of the pattern. You can use different yarn and/or hook but your cowl might not be the same size; simply adjust the stitches of the beginning chain (work multiples of 3). Ch 84 (you will be working with multiples of 3 to achieve the established pattern), sl st to first stitch to form a circle, being careful not to twist the stitches. Move on to work Round 1. You are not joining anywhere, you will be working in the round so as to achieve a seamless result. Round 1: V-Stitch in the next ch-2 space (from previous row); rep from * across.